I previously heard mumblings that domestic carriers were interesting in implementing "APN locks" in response to the MIC's SIM unlock guidelines. Such a lock would prevent changing the APN to use another carrier's network, even if the phone was unlocked. However, it would likely be at the software level and therefore circumventable by someone properly motivated. But what if the carrier produced the actual silicon? Which is just what is going to start happening. NTT Docomo, who pushed hard for SIM unlocking in Japan - only to turn around and effectively bar unlocked handsets from their FOMA (3G) network, is getting into the semiconductor business. Perhaps I'm seeing this from an overly pessimistic point of view, but the last entity I want making my hardware is an old, entrenched company that is under unprecedented pressure to compete in a market that it formerly owned (essentially). "Communications Platform Planning Corporation" [My translation of 通信プラットフォーム企画 株式会社, not NTT Docomo's] will be a joint venture between five domestic and foreign handset makers, with NTT Docomo being the sole investor to start (¥450 million). The company should be established by mid January 2012. The handset makers are expected to be onboard by the end of fiscal 2011 (March 2012), though exact amounts of their pending investments have not been disclosed. The company's efforts will focus on efficiency, miniaturization, and LTE, with the resulting silicon incorporated into both domestic and internationally available devices. Update, It seems that this was caused by overloaded servers. On Tuesday 12/20, a portion of NTT Docomo SP Mode Mail customers had their mail address swapped randomly with other users. This incorrect address was displayed to recipients of mail sent by affected customers. Replies were also directed to the incorrect mail addresses. Thus far, NTT Docomo has received 103 complaints of incorrectly set addresses. The reason for the problem is under investigation. To verify your address, from mail settings go to other (その他) and then address. 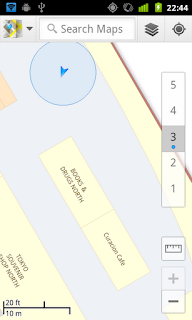 If the wrong address is displayed, reboot your phone to restore the proper address. NTT Docomo has partially suspended SP Mode services in response. See the announcement for the fully list of stopped services, but it is probably a bunch of stuff that no one reading this blog uses anyway. Apparently feeling pressure from JCI, the company behind the popular b-mobile and Aeon SIMs, NTT Docomo recently announced a 128 kbps data plan that doesn't cost in excess of ¥5,000. The pricing and data speed put it in direct competition with the 100 kbps Aeon Plan A. To put this into perspective, Docomo's previous price point for 128/64 kbps (down/up) was an astounding ¥5,985. To compete with JCI, Docomo has had to drop the price of this plan by nearly 600%. The link to this old plan is likely to die, but here is a writeup. While Docomo may have conceded on price point, they are still loathe to do away with their 2-year, automatically renewing contracts, which are standard with all Japanese carriers. In addition, Docomo is also including the (bogus) ISP fee on top (waived during the campaign). And, the base price of service is more. The Aeon SIM is the clear winner in this fight. 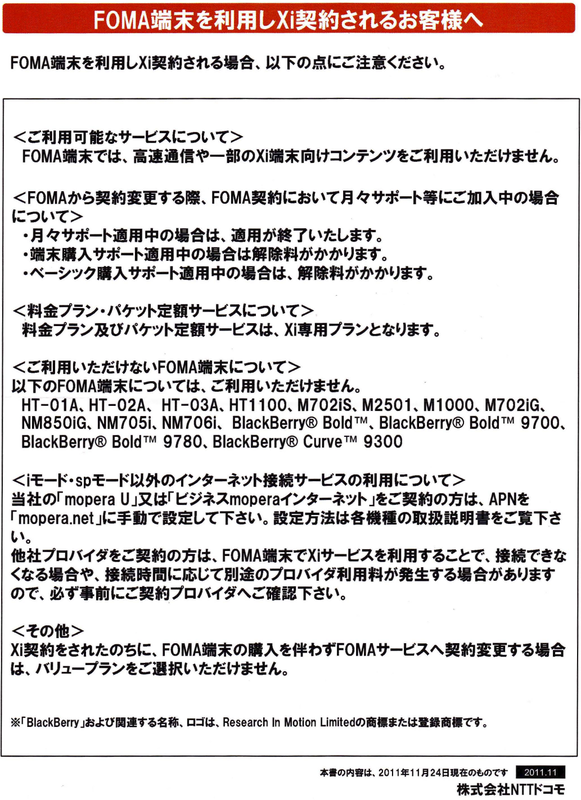 If you are wondering why Docomo would even allow JCI to do this, since JCI is in fact using Docomo's FOMA network. The answer is simple. JCI won the right to do so in government arbitration. Before that, all deals were done behind closed doors. 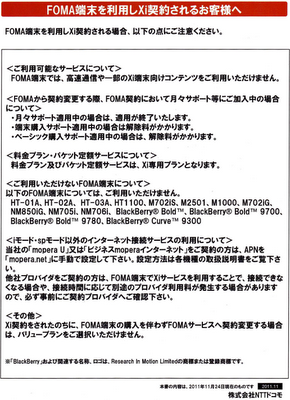 Now anyone can become an MVNO using Docomo's FOMA and Xi networks, and the wholesale terms and pricing are set and in the open. There is one place where Docomo could potentially best JCI. The SIM cards that Docomo provides to MVNOs lack particular components that cause the infamous niggles such as lack of signal bars and 3G icons, which in turn results in excessive battery use by the cell phones radio as it boost power searching for a signal (even though it has a signal). Docomo could provide it's own customer with SIMs that don't cause this problem, but I seriously doubt they will. The postpaid, AEON exclusive b-mobile SIMs now support voice. The terms are the same as the AEON data-only SIMs: residency required and payment via credit card. A 1-year contract is required, but it does not automatically renew. No microSIM are available. Current users of AEON data-only plans won't be able to continue using the same SIM card. From the product page, here is a table showing the potential pricing. On a recent visit to the US, I purchased a T-Mobile prepaid SIM card for use in my Nexus One. The entire process took less than 10 minutes, and I was quite satisfied with the service. I'd certainly use them again in the future. Currently, T-Mobile offers both 1) monthly prepaid and 2) daily plans. I only needed service for about two weeks, so the daily plan was the best option. I got unlimited voice and SMS, and 200 MB of data per day for $3/day. Extrapolate over a month, and this would be $90, which is the most expensive way to get a month of service from T-Mobile. This converts to ¥7,200 (~ ¥80 to the dollar), which equates to the bare minimum charged by Japanese carriers. (The only way to pay less in Japan is to not use the phone at all.) The 200 MB would get around 6 GB/month of data, which is comparable to Xi's 7 GB. To be fair, Japan's urban 3G coverage is excellent. In contrast, while in a major US city, my connection often fell back to EDGE, even though my phone is the T-Mobile version. There are, of course, some caveats. First off, the SIM card must be purchased for $10, though this is half of what Docomo charges (¥2,100). The SIM card expires after 90 days of inactivity and can't be subsequently refilled. Refills are purchased in $10 increments, which is why I only bought 10 days of service (for $30). In computing, an asterisk * is a wildcard that may stand for any character. To cell phone companies, it is a mathematical operator that changes the sign of the term it follows. For example, plus one (+1) becomes minus one (-1). Night becomes day. 4G becomes 3G, and unlimited becomes limited. This brings me to my only gripe with T-Mobile; their advertising is a disingenuous. How do they get away with calling a 3G network 4G? There is a strict definition of 4G. Docomo's Xi LTE network is probably the world's fastest, but Docomo doesn't even call it 4G. Because it's not, not until it reaches a theoretical downlink of 100 Mbps. So Docomo calls is 3.9G. This "4G" term is also used in the fine print on the unlimited* data plans, which is wrong in more ways than one. A plan really isn't unlimited if data is throttled after exceeding a cap, and this statement makes it seem like you'll be reduced from 4G to 3G speed. In reality, 4G speeds don't exist, and after the cap, speeds are reduced to 2.5G EDGE speeds. But these are really minor gripes, and I guess in the US, this type of advertising in to be expected. With every company doing, those who don't would be at a major disadvantage. The new indoor maps are just awesome. Instead of walking to the end of the international terminal at Haneda to see if there was a better place to get a beer, I just checked the phone, turned around, and went to Curacion Cafe, where I am now. 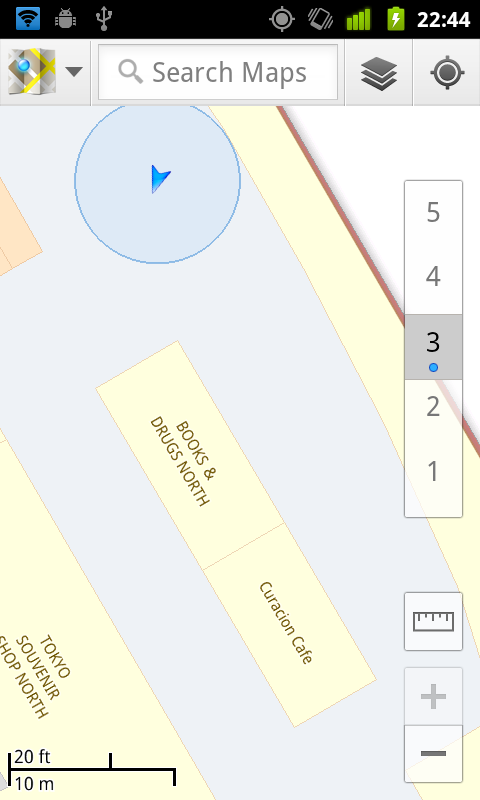 The wifi-based location is also quite good - only off by about 20 m, which is not bad for indoors. Nikkei reports LTE iPhone and iPad coming to NTT Docomo, Docomo denies. Interesting day. Today, the Nikkei reported that an LTE version of the iPad and iPhone are coming to NTT Docomo next summer and fall, respectively. The article claimed that, according to many involved parties, NTT Docomo CEO Yamada and VP Tujimura were in the US during mid November for direct negotiations with Apple's new CEO, Tim Cook. However Docomo quickly denied this. NTT Docomo has forged an agreement with Apple to sell the the next generation of the popular iPhone and iPad. Based on the agreement, NTT Docomo expects to first release an LTE iPad next summer, follwed by an LTE iPhone in Fall. Today, it was reported in the press that NTT Docomo will begin carrying the iPhone and iPad. However there is currently no agreement in place with Apple. NTT Docomo are in fact not currently engaged in negotiations. If Docomo was actually in negotiations with Apple for iStuff, and if that iStuff was going to be LTE, and if Docomo just leaked that to the world, then it's not hard to imagine that Docomo would no longer be in negotiations with Apple and would never see any iAnything. Forever. And ever. Especially if Steve was still around. So, Docomo would have no choice but to implement damage control quickly and deny the report. On the other hand, the Nikkei report could be all BS.